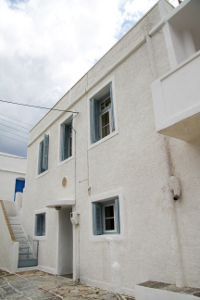 Katigianna house, is located in the center of the village on the stone paved pedestrian footpaths of Kastro, in a very quiet neighborhood. It is 3 Km from Apollonia town. The nearest restaurant and bus stop is 200 m. away, the nearest pebble beach is at 300 meters and the nearest sandy beach is 8 Km away. This is a two-story detached house with an interior staircase, a good example of original Kastrian architecture, and is suitable for up to 5 persons. Upstairs there are two air-conditioned bedrooms, one with a double bed and one with a semi-double bed. The bedroom with the double bed has a balcony with limited side sea view and view of the surrounding village. On the ground floor there is a large living room with a TV and two sofa-beds, an equipped kitchen, and a bathroom. This house was built in the late 19th century and renovated in 2007, respecting its traditional architectural wealth and simultaneously incorporating all the necessary modern facilities to ensure a comfortable and enjoyable stay. Elegantly furnished and decorated.